With a loyal online following and a client date book that fills up faster than it takes to watch to the end of her Instagram stories, British-Asian tattoo artist Heleena Mistry, 21, is one to watch. Her work pulls from Indian artistic tradition with strong Mughal profiles, Hindu iconography, and familiar floral patterns. It’s instantly recognizable for its bold outlines. 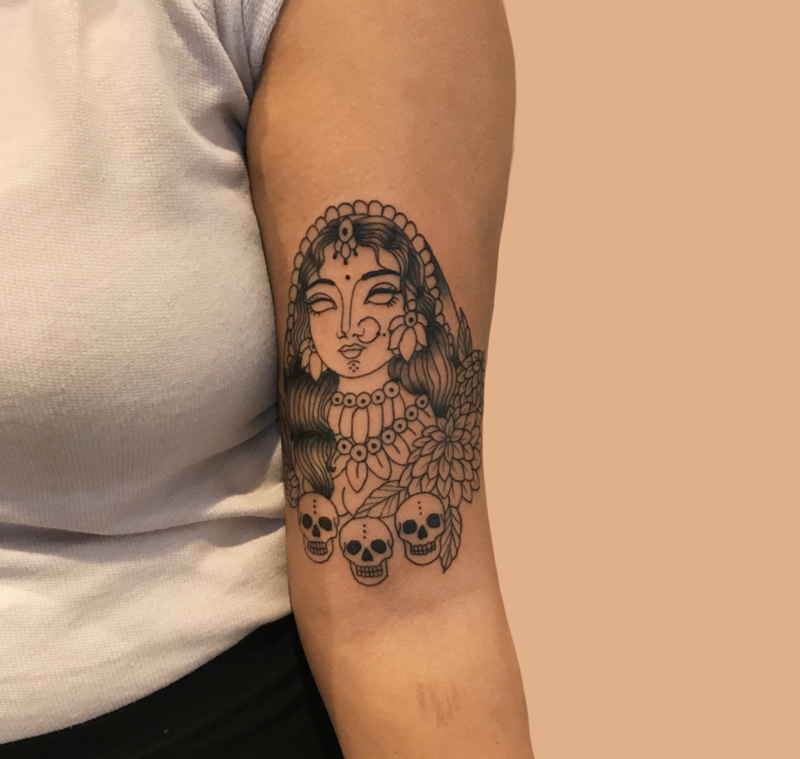 But despite her beautiful designs, South Asian tattooists are pretty uncommon and that comes down to how stigmatized tattoos are in various South Asian communities. This is something Heleena has personally spoken out against whenever she gets the opportunity, like most recently in her interview with the BBC. Heleena isn’t one to back down from a fight. Kajal recently sat down with the young artist to talk about her work, her vision, and her role in the global diaspora. Kajal: How did you get started tattooing? 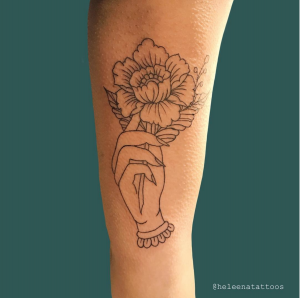 Heleena: I decided I wanted to be a tattoo artist when I was 18, from then I worked everyday building a portfolio for a year, and then I landed my first job in a tattoo studio as an apprentice. What is it about tattooing that attracts you to the medium? I loved the idea of people wearing my artwork, so I originally wanted to go into fashion from a young age and then I realised tattooing was a more permanent way of people wearing my work. Your stuff is so iconic and beautifully influenced by classic South Asian art styles, how did you develop it? It feels like I can see one of your tattoos now and instantly recognize it as yours. It’s taken a lot of practice, sleepless nights and tears to get to where I am now. I have a love/hate relationship with everything I create and I still don’t feel content with everything I put on show but the main thing I’m happy with is all the inspiration I get from traditional South Asian artwork. They’re all timeless pieces and it’s a very important quality to have in something as permanent as a tattoo. As a brown woman tattooing, do you run up against bigotry in the industry? What about South Asian taboos and stigmas when it comes to tattoos? I honestly feel like it was easier for white artists to get into tattooing than it was for me, I worked hard for years before I found my place in a shop and I knew of people that couldn’t even draw but were able to work in tattoo studios. Every time something didn’t go my way in tattooing my family would encourage me to give up and find “a real job.” I was often told that no one would want to marry me, or I wouldn’t be accepted because of my tattoos and my job. Obviously that hasn’t stopped me. What’s been the most gratifying part of tattooing? I know you ink brown girls (all of whom are ecstatic to get a tattoo designed by you), do you ever feel like a an icon or even generally someone with a platform? What does that feel like? The most gratifying part of tattooing is to have someone love your artwork enough to have it on them forever. To me there’s no greater honour. I don’t feel like an icon, I’m just a normal Indian girl, but I really wanted to show brown girls that we are not confined to our skin colour and gender, we are capable of doing whatever we want to do. It’s really humbling to see that other SA women have seen/heard my story and it’s pushed them to do what they want to do. What’s in store for you? Any projects on the horizon? Right now I’m just working on building up my clientele, doing more tattoos and making sure I keep on top of drawings. I’m working on a mini series showing Desi couples in the LGBT community, drawing them in a traditional style with my own twist.